Embark on the path to cultural transformation! 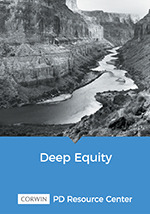 The Deep Equity PD Resource Center provides facilitators and educators with all the materials needed to begin conversations around systemic equity reform and culturally responsive teaching. Facilitators can use the resources to lead participants through the 5 phases of the Deep Equity program developed by Gary Howard. Educators will have 24/7 access to multimedia and PDF resources, providing unparalleled flexibility for when and how they engage with the concepts and practices of Deep Equity.